MANILA, Philippines – The Professional Regulation Commission (PRC) and the Board of Aeronautical Engineering released results of November 2017 Aeronautical Engineer board exam today, November 20, 2017 or in two (2) working days after the last day of examinations. The official list of passers, top 10 (topnotchers), top performing schools and performance of schools are available on this page as announced online. UPDATE: 235 out of 376 passed the exams. 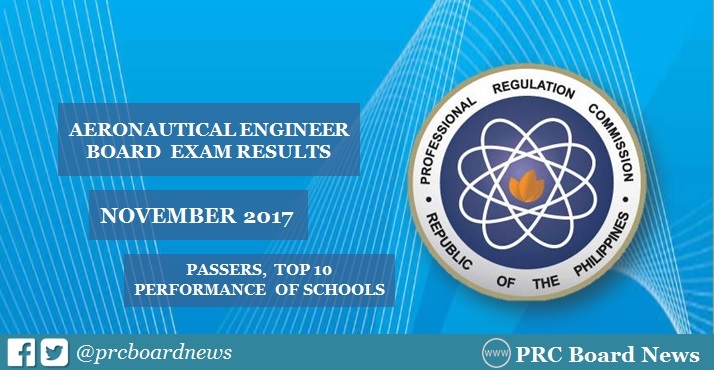 PRC administered the Aeronautical Engineer licensure exam in Manila on November 14, 15 and 16, 2017. The members of the Board of Aeronautical Engineering who gave the licensure examination are Engr. Ernesto B. Ferreras, Jr., Chairman and Engr. Redentor C. Malia, Member. The three-day examination covered the following subjects: aerodynamics, mathematics, aircraft structures and design and aircraft construction, repair and modification, aircraft power plant and engineering economics and management laws and ethics. According to PRC Resolution No. 2016-1019, the target release of results for the recent Aeronautical Engineer board exam is on Monday, November 20. We advise takers to closely monitor this page for the updates. In the November 2016 board exams, results were out in just two (2) working days. A total of 170 out of 314 passed the exams. Holy Angel University (HAU) was hailed top performing school garnering 100% passing rate. Guiseppe Andrew Bancaso Buffe of Philippine State College of Aeronautics (PSCA) - Pasay topped the board with 91.60%. The November 2017 exam results were also announced in 2 working days. 165 out of 271 passed the tests. HAU was also the lone top performing school. PSCA-Pasay alum Justin Francis Conrad Villanueva Austria aced the board with 90.50%. PRC Board News will update this page immediately once the results are out online. You may also monitor release of results on PRC's official website (prc.gov.ph). I am so excited!!! Positive! Good luck! Results are out later. Think positive.